The Czech Republic; for over 600 years the so-called ‘Bohemian Garnets’ have formed the bulk of pyropes used in jewellery. 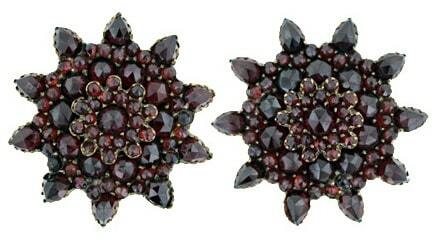 Especially in Victorian times, these garnets were coveted and often covered entire jewelry items. These stones were typically cut in the so-called rose cut. Navajo Reservation in Arizona, USA; Going by the Name Arizona Ant Hill Garnet, this Pyrope, which is Mainly Colored by Chrome, was Initially Found Because Ants had Transported Them Up to the Surface. These Garnets were Never Mined Commercially and their Occurrence in Antique Jewelry is Rare. South Africa: Found as a By-Product of Diamond Mining, These Pyropes Have Been Used as Indicators of Diamond Deposits. They occur in Kimberlite Pipes. Other Localities Include Sri Lanka and Russia.